Unbelievably, I’m coming to the end of my term on the Archaeology of Reading Project, time really has flown by! Whether through writing up transcriptions or checking them, I’ve been very lucky in having encountered quite a few of the books from the corpus we are using, including the Livy, Olaus, Domenichi, and Melancthon texts. One of the things I have found the most remarkable is the enormous variability in Harvey’s method of annotation. While texts like Olaus’s Historia de Gentibus Septentrionalibus are lightly annotated, as has been discussed in previous blog posts here, Harvey demonstrates a profound aversion to blank space in his use of the Domenichi volume. There is some consistency between texts insofar as he uses a fairly fixed set of symbols with which to flag certain types of content, but on the whole each book tends to evidence a distinct style of annotation. The Newberry library’s copy of The Book of the Courtier was fairly straightforward to transcribe in its lack of fiddly in-text marks; Olaus’s Historia, on the other hand, was a very different story, with a profusion of tiny plus signs all over the page. I (and many of my colleagues!) am simply desperate to know what it means, but it has remained elusive to us so far. 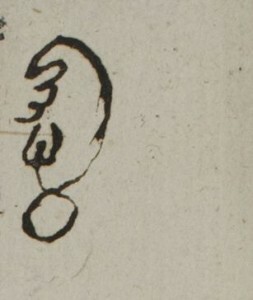 I will certainly make no complaints if anyone has any exciting suggestions as to what it might be, but it also serves as a reminder that marginalia are not a transparent window into the mind of readers of the past, and that they always require an act of interpretation to be used in modern scholarship. I am certainly very sad to see the end of my time working with such a wonderful group of people, and I cannot wait to see what the AOR team does next!